An Office 365 administrator wanted to change the email address on some room mailboxes. The powers that be want to change the display names and email addresses of our conference rooms. I tried to make the change, but the Office 365 admin interface shows me that the account does not have the ability to add a secondary email address as it doesn't have an Exchange Online license. It sounds like you are trying to make this change from the main Office 365 Admin portal. 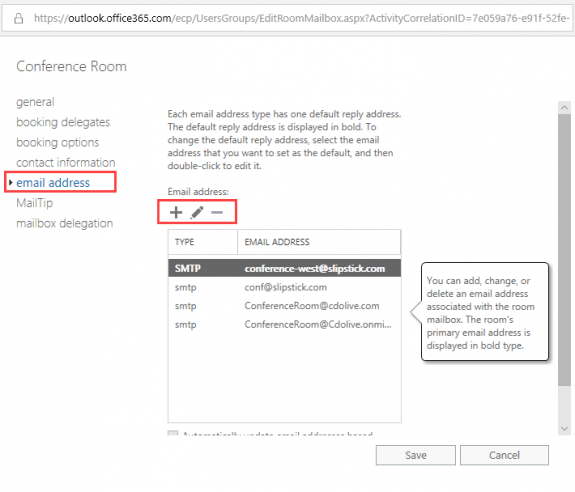 You need to edit the room mailboxes using the Exchange Admin center. At the bottom left, expand Admin Centers and click on Exchange. In the Exchange Admin Center, click Resources (just below "Welcome" and "recipients"). Select the room and click the pencil icon to edit, or double click on the room name. Set the new address as the default address.